Dealers, designers and installers in March converged at the CHAUVET South Florida headquarters for an intensive 3-day educational workshop led by Product Development Manager Barry Abrams. 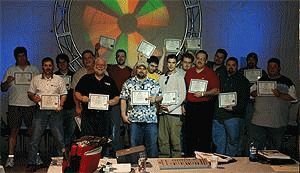 They practiced programming, installation techniques, troubleshooting, studied the practical applications of lighting specifications and earned a certification of proficiency in ShowXpress™ DMX software. Participants also exclusively previewed up-and-coming CHAUVET fixtures. And they seized this unique opportunity to network with peers and CHAUVET professionals either during the formal training sessions or during informal gatherings over drinks, lunch and dinner. This in-house seminar initiative was a first for CHAUVET in an attempt to more actively foster a strong command of the technical aspects of lighting by sellers and users alike, CEO Albert Chauvet said. “ We find that there is a direct correlation between a dealer’s level of familiarity with lighting and sales in that particular dealership. Same with installers: The more they know about lighting, the more they can appreciate the value in our products and share this with their own clients.” Each trainee received a Product Training Certificate at the end of the session.